Tires available per entry: From Firestone: The dry-condition (slick) tire specifications are the same as used at five street courses this season – St. Petersburg, Long Beach, Detroit, Toronto and Baltimore. The wet-condition (grooved) spec is the same that debuted in 2012. 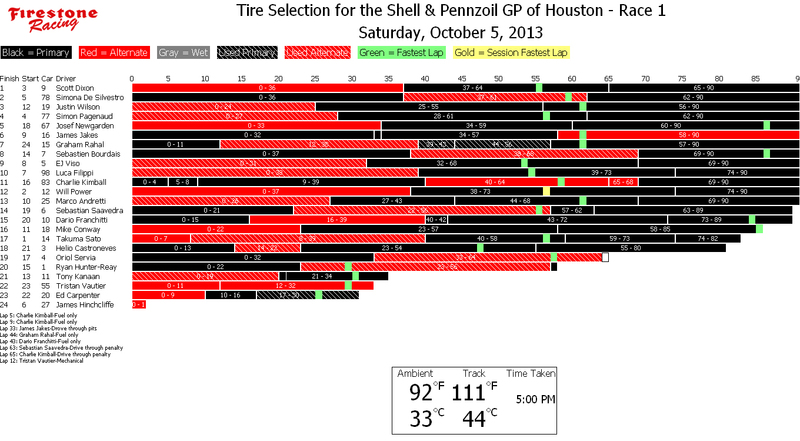 One set = four tires.Primary (black-sidewall): Each entry receives nine sets* for the race weekend (*-each entry must complete at least five laps during the first practice session to earn the ninth set of primary tires from its weekend allotment); rookie drivers and those outside the top 10 in points receive a 10th set that must be returned following the first practice session. Alternate (red-sidewall): The alternates pair the same tire construction as the primary spec with a softer tread compound to provide more grip and faster lap times, while trading off some compound durability. Each entry receives three sets for the race weekend. Wet-condition (rain): Each entry has five sets available for the race weekend. Race 2 qualifying was cancelled due to rain. 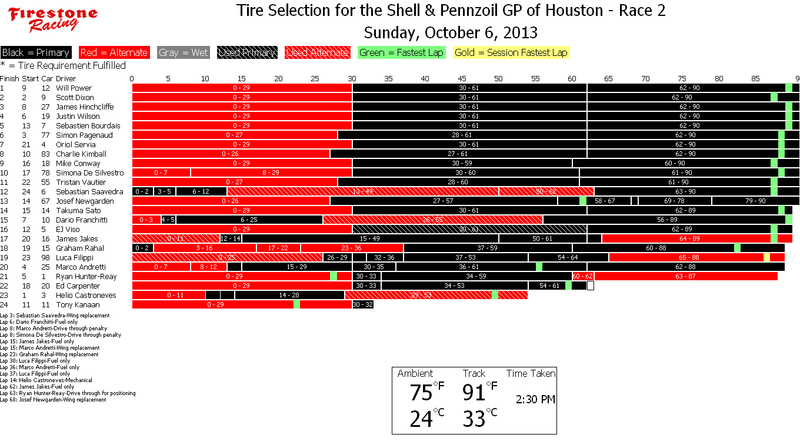 Race 2 grid was set by entrant points coming into the double-header weekend (i.e., before Houston race 1). 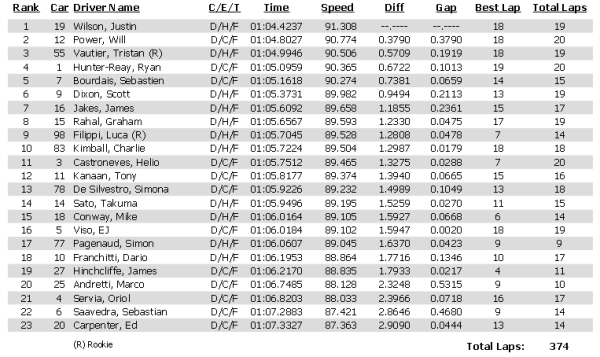 Serving an engine change grid penalty in race 1: 7-Bourdais, 10-Franchitti, 15-Rahal. 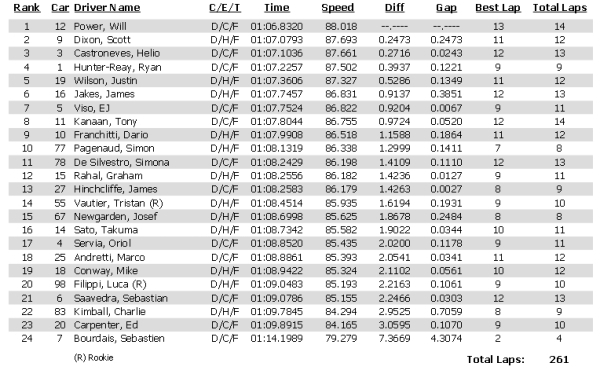 Group 1, 2:00: Red flag for 55-Vautier, who stops on front straight after hitting wall in Turn 10 with right rear of car. Car is missing rear wing and right-rear tire is flat. Vautier will lose his two quickest laps of the session. His top lap was second quickest overall at time of accident. 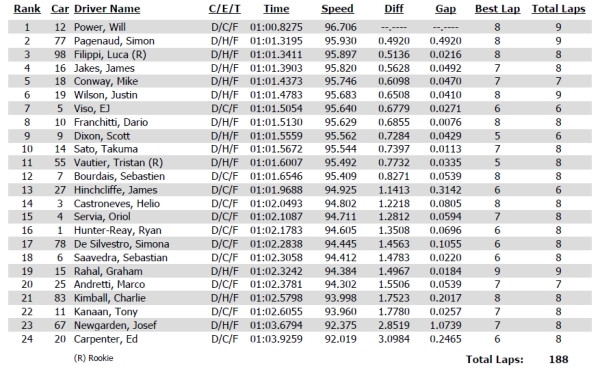 Group 2: 15-Rahal lost two quickest laps of session due to qualifying interference. Group 1: 5-Viso, 6-Saavedra, 9-Dixon, 11-Kanaan, 14-Sato, 15-Rahal, 16-Jakes, 18-Conway, 20-Carpenter, 27-Hinchcliffe, 77-Pagenaud, 83-Kimball. Group 2: 1-Hunter-Reay, 3-Castroneves, 4-Servia, 7-Bourdais, 10-Franchitti, 12-Power, 19-Wilson, 25-Andretti, 55-Vautier, 67-Newgarden, 78-de Silvestro, 98-Filippi. Group 1: 1-Hunter-Reay, 3-Castroneves, 4-Servia, 7-Bourdais, 10-Franchitti, 12-Power, 19-Wilson, 25-Andretti, 55-Vautier, 67-Newgarden, 78-de Silvestro, 98-Filippi. Group 2: 5-Viso, 6-Saavedra, 9-Dixon, 11-Kanaan, 14-Sato, 15-Rahal, 16-Jakes, 18-Conway, 20-Carpenter, 27-Hinchcliffe, 77-Pagenaud, 83-Kimball. 4:00 – Red flag for 20-Carpenter, who stops in runoff in turn 6. 12:00 – Red flag for 3-Castroneves, who hops the curb in turn 2 and spins to a stop. No contact. 22:00 – Red flag for 20-Carpenter, who stops in the exit of turn 2. 31:00 – Red flag for 27-Hinchcliffe, who stops in turn 3. 44:00 – Red flag becomes checkered for 3-Castroneves, who hops the curb in turn 2 and spins to a stop. 11:00 – Red flag for retrieval of cone in turn 2. 18:00 – Red flag for 7-Bourdais, who stops on track between turns 5 and 6. Bourdais reports dropped cylinders. Car is towed back to pit lane. 28:00 – Red flag for 67-Newgarden, who made contact with the tires in the temporary chicane. 42:00 – Red flag for two separate incidents: 1-Hunter-Reay jumps curb in turn 2 and makes contact with wall, causing left front damage; 19-Wilson spins and stalls in racing line at entrance to turn 3.